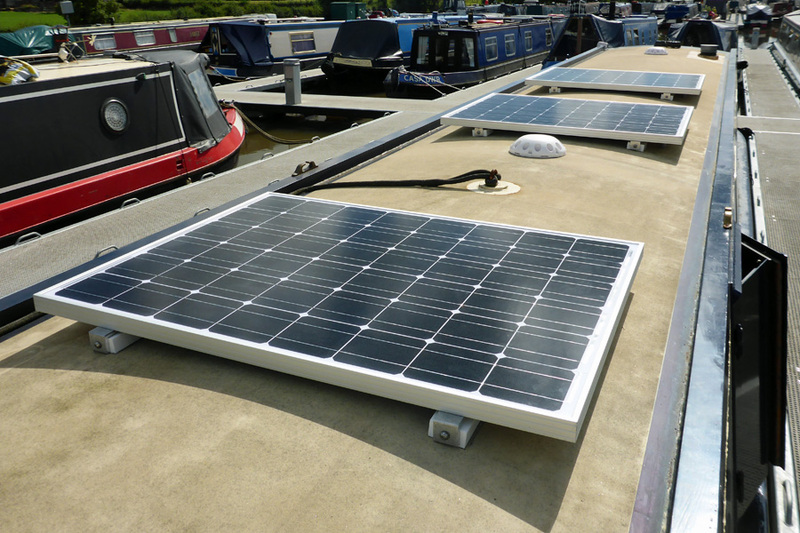 Eating the sun while it cooks me alive #narrowboat #solar – The Diesel-Electric Elephant Company. Yesterday was ridiculously, disgustingly, liver-churningly hot and humid, and today is predicted and looks likely to be even more foul. I do solemnly swear and affirm that if just one more short-shorted, belly-button-revealing-t-shirted, manky-footed-Croc-sporting person wobbles on at me about how “isn’t it lovely?” and “gorgeous weather” I will exercise my cricket-bat on their brain-casing. It’s not lovely, it’s inhuman, even in the shade. Worse than that, it’s un-English! So, quite frankly, are some of the “sights” that this weather brings out – truly, what has been seen cannot be unseen, no matter how much one’s brain vomits. My retinas still bear the greasy after-image shadow of that… lady, the one wearing what looked like a pair of bloke’s too-small budgie-smugglers, the fringe she’d cut off her great-grandmother’s never-washed net curtains and, where human skin ought to have been, a layer of whipped Factor-50, cellulite, bum-fluff and self-deception. Yes, I am well aware that I don’t look good either – so that’s why I keep a respectable layer between my “oh-my-good-gods-is-that-even-human” body and Her Majesty’s public! Just to give you a smidgen of what this weather brings out, here’s a photo of a dead rat’s arse. Still, being the stalwarts (Stalinist warts?) that we are, the Bro and I got the extra domestic solar panel mounted and wired in. There are now three one-hundred and thirty-five watt panels on there hooked up to a controller designed to keep the domestic batteries happy. Towards the blunt end is a single thirty-watt panel that has been given a separate controller and the assigned the task of keeping the starter battery in Olympic form. If I were to bung my solar-powered torch (possibly the world’s greatest technological oxymoron) and my solar-powered DAB radio on the roof too then I have no fewer than six solar panels gobbling up the sun’s effluence. Serious confession time. The sun scares me. Honestly, it does. It’s a chuffing great ball of nuclear nonsense, it’s wholly eight light-minutes away, and it can – at the drop of a summer cloud – make my life unworkable. I just can’t do “heat”, and by heat I mean anything much over 63°F with a pleasant breeze and some tree-rustled shade. When, as today in England, it’s in the nineties, all that I can do is to sit and stare at my feet. I can’t walk, I can’t talk and I certainly can’t work. Even my laptop hates it – the fans, as of 08:40hrs, are on high-alert and 50,000rpm. Yestereve’s relief of Mafeking. Um, I mean “sun-set”, yestereve’s sun-set. No-one else seems worried. If the sun were, for example, just one light-minute closer how would we ever get our Pimms chilled? Don’t tell me that hot and humid is lovely, and that a tropical island is some putative “paradise” – they’re all Hell. Consider this if you will. If you were to grab the keys to your Toyota Priapus Hybrid or whatever it is that you drive and head towards the sun at 70mph it would only take some one million two hundred and twenty thousand or so hours of constant driving to get there. That’s far too close, even if it would necessitate listening to one or two of the CDs in the car twice. Anyway, so alright already with the horror stories, what else have you done this week, eh? When fitted, the panels have the flavour of a Victorian buttoned-velour seat cushion. This is the stuff that’s going in – layers of acoustic foam and various densities of rubber (from “doh” to “ug”, one presumes). Many, many fine sundry items have been going back in place, such as fire blankets and extinguishers. The washing machine now has its own cupboard, tucked up and out of the way under the gunwale in the galley, soon to have its own power supply. The first of the nifty perspex-and-chrome photo-frames has gone onto the cabin wall, and very sleek it looks too (ten quid plus p&p from Amazon, A3 size). The last of the uninvestigated wiring has been investigated and changes planned, ditto the plumbing and new taps. The final two of the four “Breezies” have gone on the roof in place of the mush-er-oom vents – tiny wee flying saucers, in a neat formation from stem to stern and with teensie-weensy little fans to push air in or out of the Cardinal’s innards. These latter take the place of the punka-wallahs sitting in the corners with fans tied to their toes. I am an equal opportunities employer, and have given them all a guinea in redundancy money, a letter of reference and the same opportunity to catch a bus back to Poonah from the stop outside the marina. Batteries not included, although, if they were, my solar panels could now charge them up within nano-seconds. It is now 09:15hrs and I am already sitting here with a damp flannel on my head and one foot in a bucket of water. Today may very well be cancelled due to inclemencies. No, much better that I stay indoors, lie on the floor and think about penguins and ice-cubes and lovely winter snow-storms. I’m not strong enough for outdoors in these conditions. There are jobs abounding on the “still to be done” list. I’ll just have to start working night-shifts. In the meantime, I will leave you with my best wishes and my fervent hope that the great bird of happiness craps in your beer. Exits stage left to the sound of water being poured over his pith helmet. Oh, sod it. I am very over-warm Hector. Oh, how I remember cool. I have fond memories of cool. Cool? Cool? Where are you, Cool? Cool, come home, you fool, all is forgiven. I like the idea of punkha-wallahs on your boat. I, too, dislike so much heat. Today has hazy cloud cover and an intermittent breeze so I am much more comfortable. The punkha-wallahs are great but the problem with them is where to park their elephants once they arrive for work. Lovely! Give or minus the dead rat I think you summed up most people’s feelings on the subject of the heat! And another one today and really am tempted to do the cold flannel on the head thing – great tip. Sitting in a sarong (note to self change before Morrison’s deliver the groceries). Even with talk of the heat, I still feel cooler knowing you sit on water, but how you manage to put solar panels in on a day like yestereve (33 degrees here) beats me. I think I need mushroom thingies on my roof and a moat. Nice one! My sympathies. I don’t do heat well either, and envy the reputed coolness of the UK during our admittedly infrequent heat waves here on the west coast of Canada. So far this summer we have had pretty decent weather — temps in the low 70s. Not enough rain for the garden, but that’s another matter. This rain is delicious, soaks right into your clothing and, the earth. It is very welcome. Rain! I’m jealous. We don’t get that here in summer. Gardeners are slaves to the hose and watering can. It’s being very hot here, too. And I’d been dreaming of how lovely it must be in England…. I’m sorry America’s fashion sense has spread like a plague even to the last bastion of good taste, The Sahib’s Marina. Your budgie-smuggler lady … has she tattoos? There is a breeze here too, but sadly it takes its inspiration from some ho0t and humid wind, possibly the Hothumidous or the Wettenwindywarm. Give up on the bookcase – spend the day staring vacantly into space instead!